Shikantaza (只管打座) is literally translated as «only focused on doing sitting». More often it is called: «just sitting» or «silent illumination». It is the main meditation technique of the Soto school of Zen Buddhism. The «just» in «just sitting» has two connotations: Firstly, one should do nothing but the sitting. Secondly, one should sit in the right «mindful» way. The Shobogenzo, an ancient document by the zen master Dogen Zenji (1200-1253), is the most important description of shikantaza. Shikantaza is often referred to as the method of no method. While other forms of meditation often have quite clear instructions — such as focusing on the breathing process — shikantaza is held to make use of pure consciousness or mindfulness. The basic idea is that one has to transcend, go beyond, the thinking mind. While sitting one should not think about the sitting, but «really» sit, being one with the sitting. The moment one stops thinking about methods or other things, the correct way suddenly appears. From the viewpoint of Zen, thoughts are a fundamental problem. Most of the time we don’t really do things, but rather think about them. That’s why zen-masters often stress the point that enlightenment is to be found in things like dish-washing and going to the toilet. There’s a famous distinction by Dogen: not-thinking versus non-thinking. One could imagine what it would be like to be «without thoughts», yet a completely blank mind is absolutely not the goal of shikantaza. The thinking has to be transcended altogether. One needs to discover individually what lies behind all these thoughts. Meditative practice stands in close relationship with central Buddhist concepts. Some people actually «see» them work. The three marks of conditioned existence, a central Buddhist doctrine (see Buddhism), will be explained from the viewpoint of the meditator. This first aspect points at the continuous flux of life. Everything is always in motion. Nothing is stable and permanent. Shikantaza is practiced from this point of view. The meditator doesn’t discriminate between experiences. Everything is accepted exactly as it is, because ultimately nothing lasts. Knowing there’s no real foundation one could hold onto, the actual practice also is of this nature. There’s no focusing on any specific experience or thought (as is usual in most meditative practices, for example anapana sati). Because of this the meditation is experienced as a mental state of openness and acceptation. This is perhaps one of the most difficult concepts to understand from the perspective of practice. Gautama Buddha says the fundamental problem of life are our desires (see Four Noble Truths). These create attachments. This implicates that we like some, but dislike other experiences. The meditator learns to be fully aware of the experience as it is. It isn’t possible to add or subtract anything any more. In this way no new attachment is created and older ones slowly fade away. 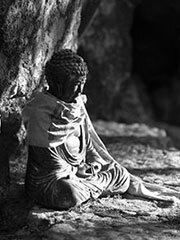 Over a period of time (some teachers say it takes approximately four years of intensive practice) it is held to be possible to transcend all attachments, thereby acquiring the original and natural state of mind (see enlightenment) in which all experiences reveal themselves as emptiness (sunyata). Buddhism teaches the concept of Anatta. Although every human has the idea of a soul, or a deep feeling of «me» or «self», Buddhism claims there’s no stable essence in a human. This can be explained as follows. When incorporating shikantaza in one’s life, gradually experiences are welcomed more and more. A great awareness develops itself, which makes it possible to look very carefully at every experience. Which reveals itself as emptiness — as explained before. Then it turns out that even the idea, or this deep «feeling» of a soul every human has, is merely an idea. A thought. Even this idea reveals itself as empty. Which means that the complete identification with this idea no longer holds. Then at once all boundaries break; suddenly there’s no difference between the thought of «me» and the sound of a singing bird. For an experienced practitioner Shikantaza is straightforward and simple. Yet, for a beginner this strange «method» is almost impossible to understand. It demands literature study (and/or teaching) and actual practice to understand it thoroughly. Its primary elucidation is in Dogen’s Shobogenzo, which is an infamously difficult work of immense philosophical, linguistic, and hermeneutic complexity. He makes extensive use of paradoxical logic, subversive quotation strategies, imagery, and a rich literary education, and it is impossible to imagine someone without significant general education and specialized training in the Buddhist textual tradition could begin to access most of the work. Contemporary teaching is often relatively easy to understand, as well as a good introduction to the classic works. Nowadays, many zen-masters have a typical, very «down-to-earth» way of speaking about the practice. Also they try to explain the whole idea of meditation and the connection to this specific practice very lucidly.